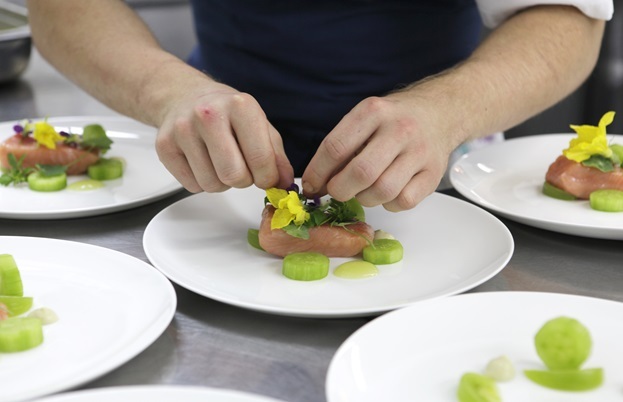 In the first of our articles with the founder of collaborative gastronomic project, Kitchen Theory, we take a look at how the plating of food affects our experience of eating it. 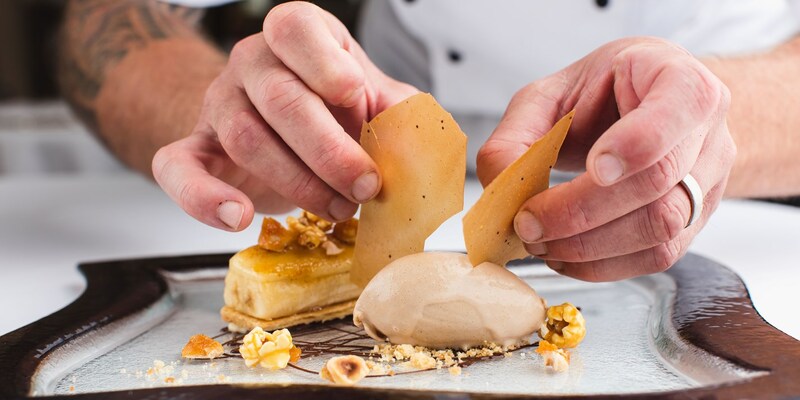 At Kitchen Theory, we are continuously looking at the sensory attributes of the dining experience or what we call ‘neurogastronomy’. 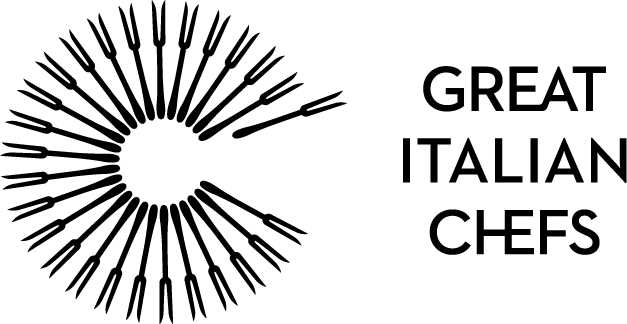 Research in this field looks at how all our senses (sight, smell, taste, hearing and touch) are involved in eating, dining and general food appreciation. It also explores the connections and interactions between the senses in relation to our understanding and associations with food. So what is it that makes us appreciate food? Is our enjoyment of food based solely on our sense of smell and taste? There is a little more to it than that . 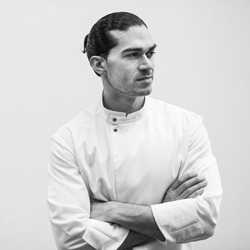 . .
As part of our mission to share knowledge in the field of neurogastronomy, we are very excited to work with Great British Chefs on a series of articles aimed at helping chefs (both amateur and professional) to understand the principles behind our sensory research and how to use them in their own cooking. We begin with the sense of sight. The sentiment ‘we eat first with our eyes’ is widely held by many cultures around the world and one which I think we all intuitively understand. But is it true? And are there any key rules or principles for food presentation that the majority agree to be more appealing? For the purpose of this article, we will look at three aspects in which we have conducted research: colour and taste associations, asymmetric plating verses central plating and, finally, the angle at which foods are presented. The relationship between taste and colour. A recent study* asked 452 participants from China, India, Malaysia and the US to view colour patches, shapes and textures online and to choose the taste term that best matched the image, then rate their conﬁdence in their choice. The study found that the most notable taste and colour associations were: salty=white, sweet=red, sour=green and bitter=black. 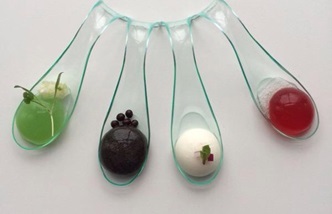 When developing a dish entitled ‘The 4 Tastes’ for our Synaesthesia series of dinners, we put these findings to the test by developing four coloured, edible spheres, each representing one of the four most recognised and familiar tastes – sweet, sour, salty, bitter. As the dish is served, guests are asked to put the four elements in order of which they perceive to be salty, bitter, sour and sweet. Once the guest has followed the instructions, it’s time to put their perceptions to the test as they won’t find out whether they are right or wrong until they have tasted each element; for some this is a straight forward experience, for others (if their perceptions differ to the findings of the study) some of the elements may be incongruent and surprising. But what are our empirical findings? We found that the majority of our diners did, indeed, have the same associations as those revealed in the study. Asymmetric plating has been all the rage for the last couple of years; it seems there are very few chefs out there who aren’t tempted to leave between half to three-quarters of their diners’ plates relatively empty. We can all probably think of examples where such dishes look good but do we actually find asymmetric dishes more appealing? 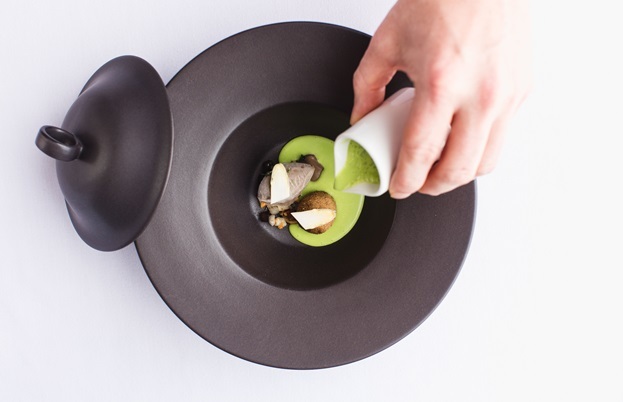 For our 2014 Nordic-inspired dining experience, Náttúra, we designed a dish entitled ‘A Taste of Nature’ and as with all our dishes we tried to find the method of plating the dish that guests would find most appealing. For this we turned to our regular collaborator, Professor Charles Spence, head of the Crossmodal Research Laboratory at Oxford University, and his team for a little help. We selected our two favourite plating options, one central and the other asymmetric, and put them to the test. Our research was based on over 600 respondents who rated both dishes based on how appealing they found the dish as well as other factors including how much they would pay for the dish. The results showed that respondents did indeed have a clear preference and it was towards central plating. 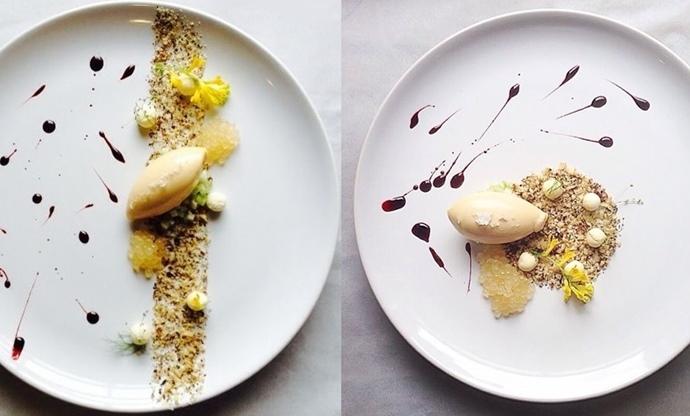 Does this necessarily mean that the fashion for asymmetric plating is wrong? Well, not entirely; we believe there is still much work to be done in this area. Nonetheless, this does highlight the fact that how you plate your food does impact your guests’ perception and expectations of the dish. Contrast of positioning in 'A Taste of Nature' for Kitchen Theory's Nordic-inspired dining experience Náttúra. Does a langoustine look more appealing when presented in the bowl at a 45 degree angle than when it’s at 90 degrees? This is what we are researching through our dish entitled ‘The Sight and Sound of Flavour’. 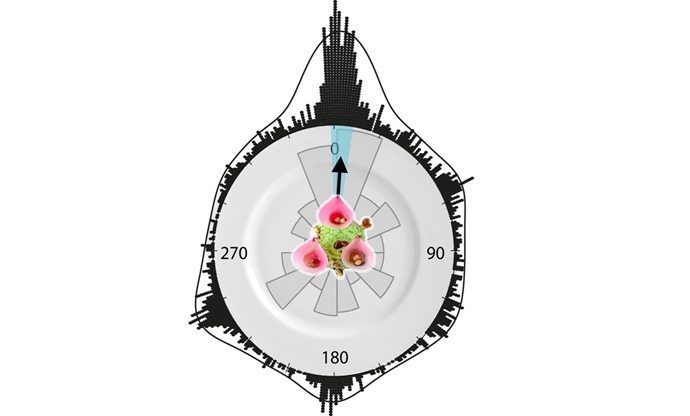 However, other such studies have been conducted at the Crossmodal Research Lab, the most relevant of which is that by chef Charles Michel, whose study which reached 1667 participants looked at the importance of the orientation of food on a plate. The results clearly demonstrate that the majority had a shared preference for particular orientations (each black dot in the image represents the preference of a respondent so the denser the clusters of dots and the longer the line, the more popular that angle was). Charles Michel's experiment from the Science Museum. Odd numbers of elements tend to be considered more appealing than even numbers – so put 1, 3 or 5 scallops, ravioli or cubes of pork belly on the plate rather than 2, 4 or 6. Plates which incorporate a broad palate of colours are favoured over dishes which are monotone. So a bland landscape of chicken and potatoes with cauliflower and cabbage should be broken up by using herbs, sauces or other ingredients to ‘liven’ them up. Look for colours which contrast with each other or support each other by making certain elements stand out. So perhaps red cabbage or purple potatoes would work well in the example above; just make sure not to compromise on flavour for the sake of colour! Contrasting colours are more appealing and make the food stand out. The vibrant green is associated with freshness and better nutrition. We mentioned the importance of colour and taste associations but colour isn’t just relevant to specific tastes. They tell us so much about foods; so vibrant green peas will go down a lot better that dull, grey peas (we associate more vibrant greens with freshness and better nutrition). Then there is the ability to slightly manipulate things; why not use purple cauliflower and yellow beetroot in purées? This is guaranteed to throw your guests off a little when it comes to their expectation vs taste. So your cauliflower purée with seared scallops can be easily turned into a sensory experience just by altering the colour. The colour and style of your crockery also influences how your dish will be appreciated. Just think about it; would sushi taste as appealing when served on a plain white circular plate? Would Irish stew taste the same if served from a tagine? How about cereal in a pasta bowl or pasta in a cereal bowl? The point is, crockery matters. Just look at all the chefs on Instagram who rely heavily on nice crockery to increase the visual appeal of their dishes. It is always worth plating up a dish before your guests arrive to figure out the best layout of the elements on the plate and whether the colours work. If preparing the dish ahead of time is not practical, do what most chefs do in their initial stages of developing a dish and draw the dish on a piece of paper. This will get you really thinking about what elements should be highlighted, how the different elements in the dish will sit together and, most importantly, give you an idea of how visually appealing you feel the dish will be to your guests. For more information about our multi-sensory dinners, visit kitchen-theory.com.